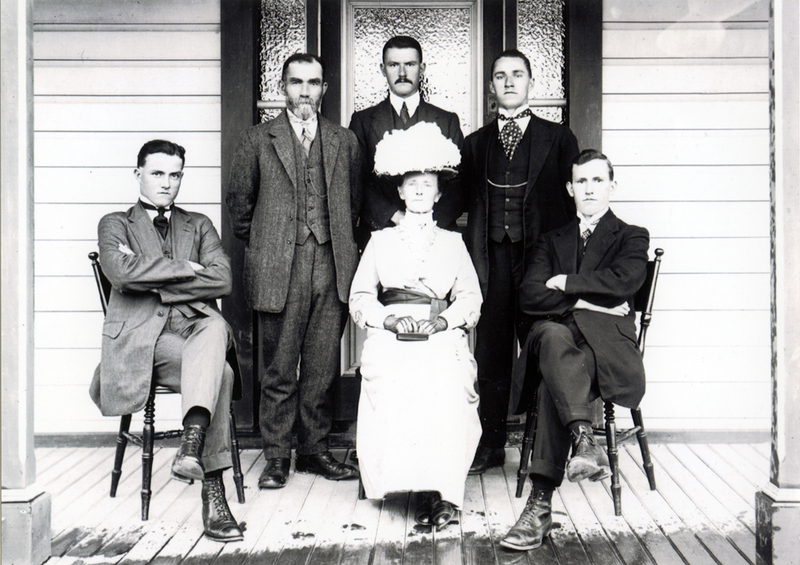 Dawson family in Masterton about 1914. From left: Samuel; Robert; Balfour; Robina (front); Arthur; Albert. The son of Robert and Robina Dawson, farmers of Dreyers Rock near Mauriceville, Samuel was one of five brothers. The first-born, Robert William, died in infancy but the others, Balfour, Albert and Arthur, lived to adulthood. Robert Dawson married Robina (often spelt Rubina) Sherriff in 1888. By the early 1890s they were near Mauriceville, with Robert’s brother Samuel a little north at Mangamahoe. Robert’s sons, including Samuel ( born in 1894) went to Dreyers Rock School. After passing Standard 6, Samuel went to Masterton Central School in 1908. His parents moved into Masterton, first to Lincoln Road and later Renall Street. Samuel was working for the Post and Telegraph Department in Masterton in 1915. He briefly joined the army before a medical discharge, then travelled across the Tasman Sea to join the Australian Naval Transport Service as a wireless operator. This got him to England where he joined the Royal Naval Air Service (RNAS) as a trainee pilot. The RNAS and RFC merged in April 1918 to form the Royal Air Force. Samuel was commissioned in July 1917. He embarked on HMS Furious, designed as a light battle cruiser but converted during construction to a half-deck aircraft carrier. An aft landing deck was added in late 1917 making this one of the first true aircraft carriers. When he joined in April 1918, Furious was in the North Sea using her aircraft to deter Zeppelin raids. In July 1918, a raid was planned on Zeppelin sheds in Tordern on the border of Germany and Denmark. Sopwith Camels were used as light bombers. Samuel Dawson, now a flight lieutenant, was chosen as a pilot on this raid, the first carrier-launched strike in history. The force of seven Camels attacked in two groups – Samuel was in the second flight, taking off early in the morning. The first group had set one hangar, containing two airships, alight. The second attack dropped bombs on other hangars. On the return flight Samuel’s Camel and another aircraft ran out of fuel. He landed in neutral Denmark, was captured and taken to Esjberg. He escaped custody, made his way to Copenhagen, sailed to Sweden and moved to Norway, from where he sailed back to Scotland. Samuel was awarded a DFC for his part in the raid. The hybrid aircraft carrier HMS Vindictive. It was during an air raid from this ship in the Baltic that Samuel lost his life on 17 September 1919. Samuel remained in service and in mid-1919 was posted to HMS Vindictive, another conversion from a cruiser to an aircraft carrier. His ship was sent to the Baltic, supporting the Allied intervention against the new Soviet Russia in the Kronstadt area. He was shot down and killed during a raid against Kronstadt on 17 September 1919. His body was recovered and buried at Koivisto Cemetery, formerly in Finland but now part of Russia. The cemetery was destroyed in World War Two and he is now commemorated on the Archangel Memorial. Samuel’s brothers all served in the Great War; Balfour with the British Army and Albert and Arthur with the New Zealand Division. Robert, Robina and Robert William are buried in Masterton Cemetery.